Soo.. Today's post wasn't really intended for the blog. Lol.. But Here it is. A couple of days ago, a friend of mine pointed out a picture of THIS MANI she saw and liked. Also, the picture wasn't properly credited, so I didn't know if the original creator made a tutorial, so since a couple of people were asking how it was done, I wrote a quick tutorial at the end of this post. I Am not crazy about this mani, but it does have a "WOW, SO Cool" thing going on with it. It's EXTREMELY EASY to create. - Use a Matte Top Coat to get the Dry black polish look. I Used Essie - Matte About You. - When your matte topcoat is a bit dry, put some of the black polish on a paper, paper plate, or stamping plate. 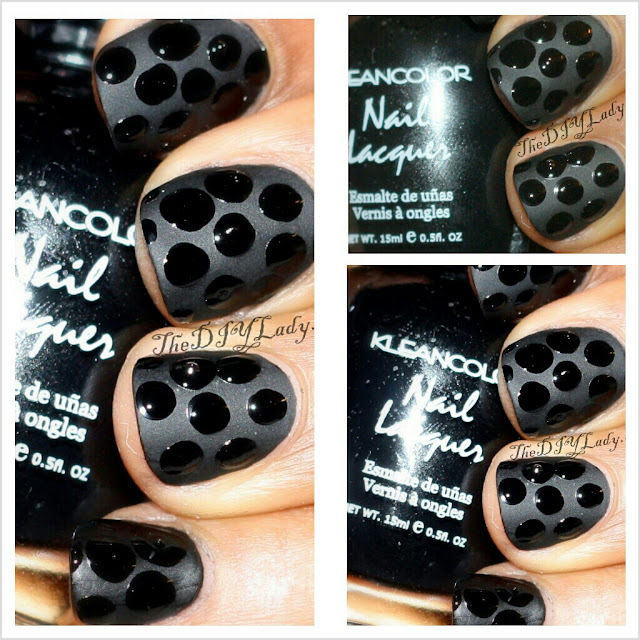 - Next, with a dotting tool or the end of a bobby pin, dip into the black polish to pick some up, and then place dots at random on your nails with the dotting tool. - Once that's done, just let it dry.. and you're done. Note: The Matte to gloss distinction is more pronounced in pictures because of the flash. I did this on Saturday Night and it's still fine looking on my nails. Gonna have to take it down to create New Year's Nails. This is a very easy to do nail art. You can do it in whichever colors you want. The Boyfriend thought it looked like "Leather nails". Someone else called it Bubbles. I just see matte and Glossy polka dots. What are your thoughts dearies? The week moved by quickly!! The year is almost to an end, and I can only say Ohhhh Wee!! I've had these Nail Strips by Mystique Nail Applique for a long time, and I finally decided to use them while thinking of what to wear for New Year's Eve/New Year! I've reviewed a different design by Mystique before. So If you want application details and my thoughts on these, please CLICK HERE. As you can see from my Middle finger, the strips also came with french tip designs and can be use for french tips/half moon if you choose. I Like these nail strips because they are easy, quick and don't require additional "equipment" for application. No need for a blow dryer, and topcoat is not necessary. Just peel it off the set, and place on your nails. Push down very well and You're done. This is not going to be my New Year's nails because I already took this out. I think I want to do something a bit more fiesty for new year! If you're interested in this or want to check out other designs, Go to their Website. 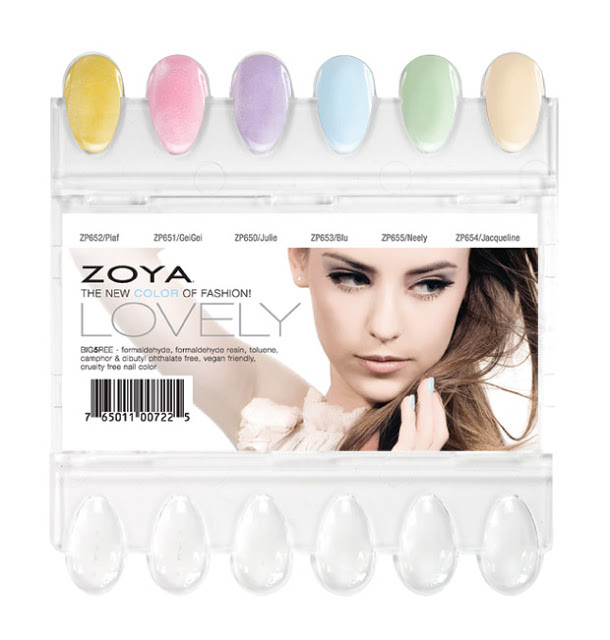 Today's post is of the Zoya Spring 2013 Collection called the LOVELY collection!!! I shared the press release of these some days ago, and I'm glad to show you swatches today. This collection comes with 3 shimmers and 3 Cream polishes. Here's a collage for ya. Please Click Read More below for more pictures and review. Today I have some polishes by a Brand whose name I'm sure we all can relate to... I ❤ NP. 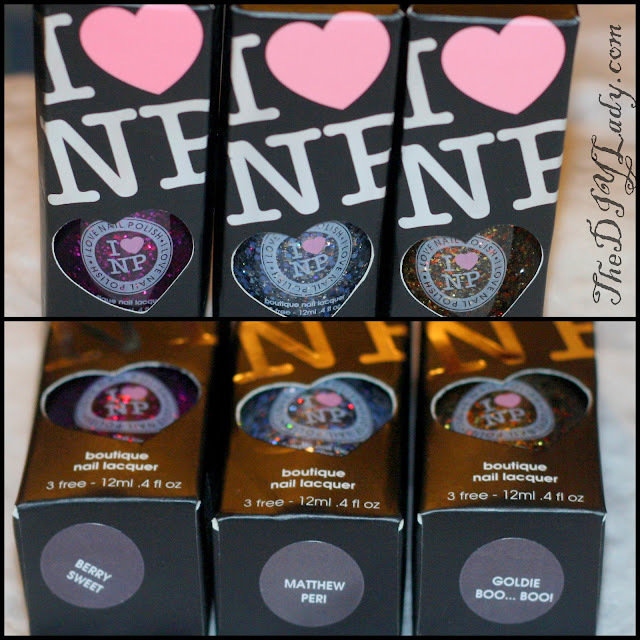 Without further ado, These are by I Love Nail Polish. As you can see, her packaging is like no other! I Just LOVE that about this brand. The packaging totally had me oohing and aahhhing. First up is Matthew Peri. This is a mixture of light pink, blue, black glitters. I layered just one coat of this over Zoya - Monica. The Coverage in one coat is amazing. Next up is Goldie Boo...Boo. Yet another one with amazing coverage. I chose to layer this over Kleancolor - Black and White. I Love both looks. And Lastly, we have my least favorite of these, it's called Berry Sweet. I Liked the glitter in the bottle but not so much on my nails. Might be the polish I layered it over. China Glaze - Jungle Queen. I Like these glitter polishes because One coat of glitter brings out a bunch of glitters. No need to fish for glitter or pile up a bunch of them just to get the desired "Glitter on my nails" look. The smell isn't offensive and they smell just like regular nail polish. If you're interested in these or want to check out more polishes by I ❤ NP, Please Check out their Etsy Page and Facebook Page. Sent for review. Opinions are 100% mine. This post is brought to you courtesy of the SNOW we're experiencing Here in Texas (DFW). I have two christmas Manis to show you all. The first is my Original Christmas manicure shown below. I use Zoya - Delilah and some nail art stickers I won from Liesly Likes Pretty Things. 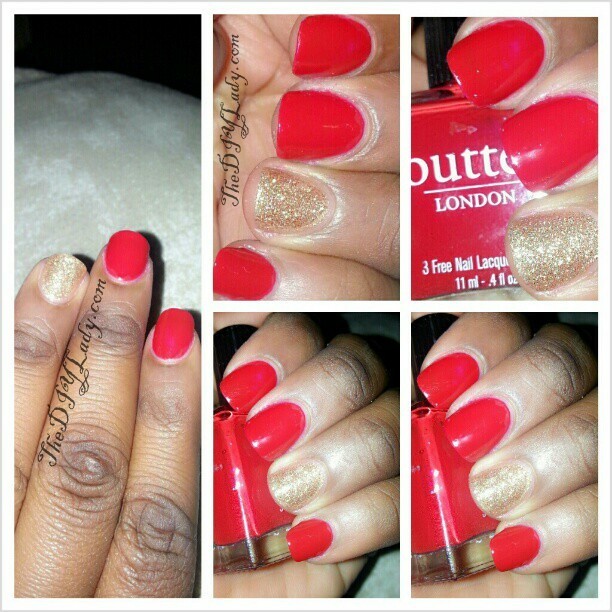 I was so happy with this mani, especially because the red complimented my skin so well. BUT when I broke a nail On Christmas Eve, I had to clean off the mani, File down all my nails, and settle for a red that ALWAYS looks good on me when My nails are nubbed. Here I used Butter London - Pillar Box Red, and accented my ring finger (which was the one that broke) with Butter London - West End Wonderland. Picture taken with my phone cos I was too tired to whip out my camera. I Loved the end result and this is an amazing mani for Christmas day. Classy, Chic and simple! Can't go wrong with the formula on Butter London. I love This red so much! Anyhoo, that's it for now dearies. May All that Christ was born For: Salvation, Love, Joy, Peace, Deliverance, Healing, Prosperity, Favor, Glory and Upliftment be yours! I Hope y'all are having a wonderful time wherever you are! Interestingly, some people "Liked" the mani, and I can only say.. WOW... It is true that One Man's food is another man's poison. Anyhoo, Today I've got some stamping plates to show you all. You must know by now that I'm not the best at freehand nail art, so Stamping plates are my best friends when I want to do nail art. This is GALS stamping Plate - The Fairy Set. GALS Cosmetic is a Subsidiary of CHEEKY. Since this Post is a Picture Spam, I urge you to please Click Read More below to read my review and view the nail art I created with one of the plates in this set. These are six different polishes that change color when topcoat is applied to them. Step 1: Apply a base coat.Step 2: Apply two coats of China Glaze® Tranzitions shade of choice. Allow to completely dry. Step 3: Lastly, apply one coat of clear top coat such as China Glaze® Fast Forward and watch the color change right before your eyes. These are interesting and might be an easy way to create nail art. I love the colors they all come in. How are you doing today. Today's post is one I am SOOOO Happy to be sharing with you! As you all know, the year is coming to an end. We saw so many Nail Trends this year! The question on every Nail Fanatic mouth is: What are the Polish Trends to watch out for in 2013?!?! Well I have the very first Trend you MUST watch out for. OMG!!! When I saw this, I JUST HAD TO TRY IT!!!!!!!!!!!!!!!!!!!!!!!!!!!!!!!!!!!!!!!!!! It's so Beautiful and Totally going to be the ONE nail Trend That I'm sure will BE AROUND FOR A LONG LONG LONG TIME!!! This is called The Polish Peel Off Method!! As you can see, I took out time to even Write the Tutorial on this Picture.. Like OMG!! How nice am I?!?! The trick to achieving this Style on your nail is to Make sure your polish doesn't come to a complete "Dry" before you start peeling it off your nails. You can use whichever color you like!!! And you can even Peel the polish off in style!! You can scrape it off in a zig-zag manner, straight line manner, or just wiggly lines like I did above. Doesn't this just look like a new Twist on the French Tip nails?? Oh My!! You can even choose to Stamp some lovely designs on them or add GLITTER for an extra POW-POW!!! *sighs*.... I just have to say.. MOVE OVER Gradient nails!! Polish Peel-Off Method is HERE TO STAY!!! What do you think darlings? Isn't this just AWESOME?! If you choose to try this Hot Nail Trend of 2013, PLEASE do not tell people that you learned about it from my Blog. LMBO. I will NOT be responsible for you getting crazy looks from people. Hahahahahah, Ok, This is the point where I shall now say... LOL!!! In case you did not figure out the Sarcasm in my Writing as you read this, I Must mention, this isn't really a Trend for 2013. This is a BAD HABIT of mine! When I'm tired of polish on my nails, I tend to start "Peeling" them off before I get to a Polish remover. When I peeled off My Pure Ice - Tinsel Town Nail polish off my nails, I humored myself by calling it a Nail Trend. Lol.. Then I got the crazy Idea of adding a topcoat to it and taking pictures of it to Humor You all on my blog! In Other words: THIS IS A JOKE and I just wanted to bring a smile to someone's face. Sooo.... Did you laugh? Lol..
Do You also have this bad "polish peeling" habit? Thanks for dealing with my craziness on this blog. Haha.. Today, I've got swatches of the Last Two Pure Ice Polishes I picked up at walmart. This is Pure Ice - Fivesome. If you've been following my blog for some time now, you'll know that I love Black polishes that packs a punch of extra goodies in them. This Fivesome is no exception. What you see here Pure perfection in 2-3 coats, and finished up with a Color Club Topcoat. The colors fused in the black is just beautiful to me. Next up is Pure Ice - Sea-Quin. Clear base, Gold shimmer, Gold Diamond shaped glitters. Pretty and makes me feel RICH! I layered it over Zoya - Bevin. Upon swatching the five Pure Ice polishes I got from Walmart, I must now say that I AM REALLY Impressed that a big company has chosen to create polishes that rival what the 'Indie makers' create! Chunky Glitters, Glitter topcoats perfection, Embedded glitters in solid base, and all round beautiful polishes!! My favorite of the five I picked up are Fivesome, Tinsel Town, and Twist and Shout. If your walmart still have these, I urge you to pick some up. I Might even be going back to my Store to pick up some more Pure Ice Glitters. The formula is great! And the price is unbeatable - $1.97 each!!! Today I have another Pure Ice Polish to show you. Yesterday I showed you swatches of two polishes by Pure Ice. This one is called Tinsel Town. So.... Are you wondering why I'm screaming?? It's because in my over 1 year of Blogging, It has never been hard for me to CAPTURE A NAIL POLISH with MY CAMERA!!!! This Polish did NOT want to be captured!!! It's Beautiful in REAL LIFE!!!!!!!!!!! I mean REALLY BEAUTIFUL!! But My camera just wasn't having it!!!! Tinsel Town is a glitter polish with clear base. It has tiny blue glitters and large silver diamond shaped glitters in it. Firstly, I Layered One coat over Zoya - Robyn. This was a VERY pretty Look. Camera captured this Well! Can't even complain!!! The Diamond shaped glitter popped and I love the layered look. Btw, Robyn is such a pretty blue. Next, I added another coat of Tinsel Town. SO the look below is Two coats over Zoya - Robyn. Do You see what I mean, by sandwiched Diamond glitters now?? YES, this is beautiful in Person!!! I then proceeded to take a video with my phone's camera... and I uploaded it on youtube. I'm more than excited to bring this news to you today. When I found out about the soon-to-be-released Collection, I was definitely eager to share it with you. 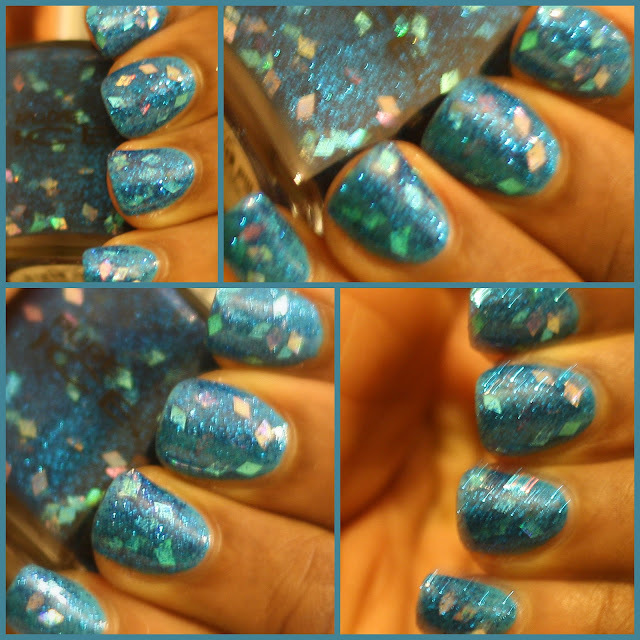 Anyhoo, this post is obviously about Zoya's Spring 2013 Collection, called the LOVELY collection! GeiGei (ZP651) - Blushing Cherry Blossom Pink Metallic - Full Coverage (Originally designed for Zang Toi/SS13). Julie (ZP650) - Soft Wisteria Purple Metallic - Full Coverage (Originally designed for Zang Toi/SS13). Neely (ZP655) - Earliest Spring Green Cream - Full Coverage (Originally designed for Peter Som/SS13). Follow the Zoya Nail Polish and Treatments Blog and stay tuned on Twitter (@Zoyanailpolish) and Facebook for release date updates. 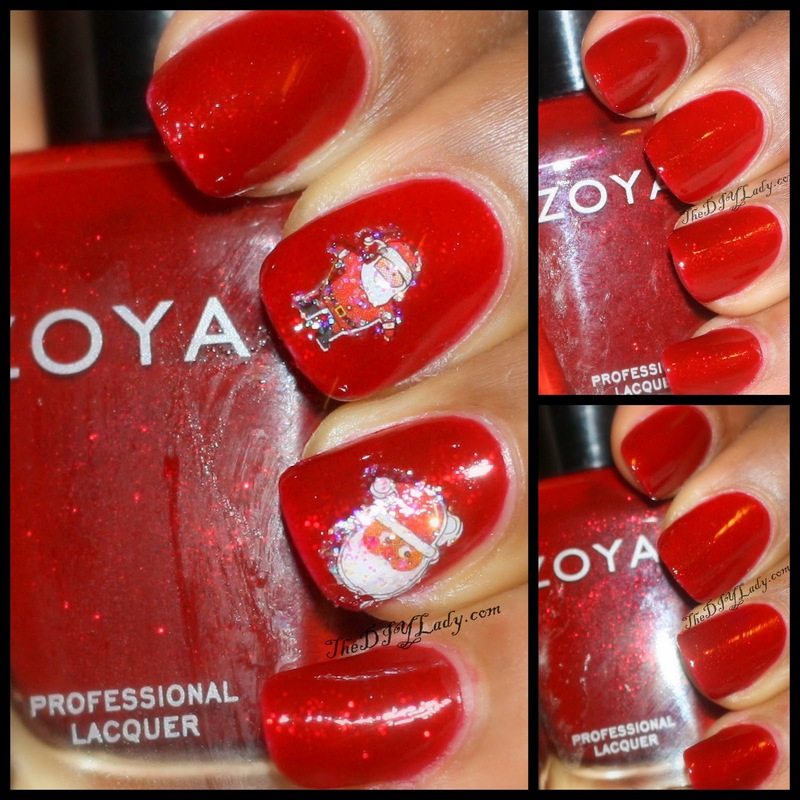 P.S: In case you are still doing some last minute Christmas shopping, CLICK HERE to check out pre-packaged holiday gifts on Zoya's Website. I like some of those! But Knowing that Pictures differ from the real thing, I probably would end up loving Piaf in person. Swatches: Pure Ice - Sleigh Ride & Twist and Shout. A couple of days ago, I was in Walmart and pick up these FIVE Polishes by Pure Ice. They had a festive look to them and they also reminded me of Indie Polishes. First up is Pure Ice - Sleigh Ride. This one is a mixture of bar and hexagonal glitters. For my swatches, I layered it over Zoya - Delilah, because it was sheer on its own. Here's one coat on plain nails. This is three coats on its own. I Like the opacity and loved this alone. It show case all the blue and red glitters!! So pretty!! My overall thoughts on both of these is that they're lovely. These are considerably cheaper than Indies too... $1.97 per bottle. WOWZA!!! Have you seen any of these at your local walmart stores?? Anyhoo, that's it for now. Hope y'all are doing fine today. Today's Post is a very personal one. Most of you know by now that I use a wheelchair for everyday living. 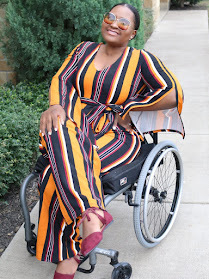 I have shared posts about my life using a wheelchair with you guys. 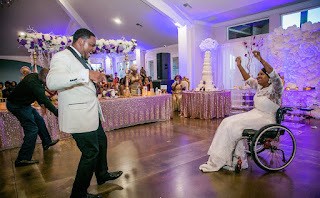 I thank God for making me an inspiration to someone out there, and I'm glad I have been able to accomplish so much despite using a wheelchair. Over the past couple of months, I've been contemplating going back to therapy for my journey to start walking. My faith has always been that I will Walk again because I know nothing is impossible with God. 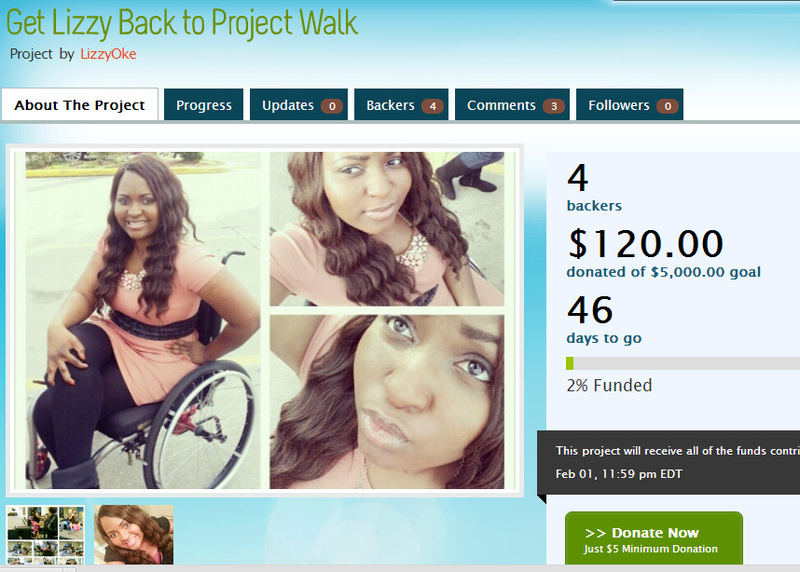 I have decided to couple my faith with WORK and go back to therapy at a place called PROJECT WALK. The reason I'm writing this on my "Hobby" blog is because I need your help. 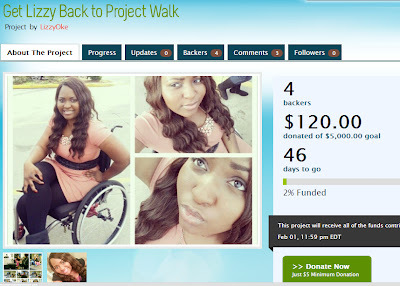 I started a fund raising page to raise funds to go back to therapy. More info on this can be FOUND HERE. Whatever you're able to donate will be very well appreciated. Y'all know it's serious when I have to let go of my babies. Hahaha... BUT This is for a good cause.. right? Oh, and Thanks Darlings, and I'll get back to regular schedule on the blog soon. I'll try not to bombard y'all with too much about this on this blog. ONCE AGAIN, Please CLICK HERE to Donate Any Amount you can. I appreciate whatever I get. 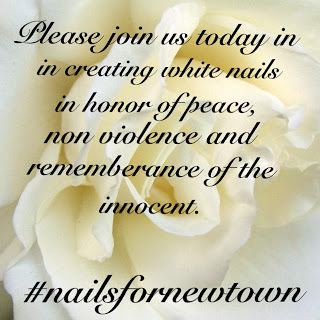 Today's mani is in honor of the innocent souls who lost their lives at the Shooting in an Elementary School in Newtown, Connecticut Yesterday. When I heard the news, I was so sad and realized yet again, that this is a cold cold world. I pray that God will comfort the families of those who lost their loved ones. I am reminded that each day is a blessing and we should all HUG and cherish every person in our lives because we never know when death will take them away. I found out via Instagram that people/bloggers in this our lovely nail community are creating Manis with white polishes as a way to show support to the families of those who lost their loved ones. The White Manis are a representation of peace & non-violence. I am glad I'm part of a community that shows concern when tragedy happens. We create manis in honor of major holidays, and to know we are also available during tragedies like this is an amazing thing. For my mani Today, I Chose to use China Glaze - It's a Trapeze. This is from their Cirque Du Soleil Collection, and this was the only polish I really wanted in the collection. Now that I'm using it for this mani, it means a whole lot more to me. I love the polish and all the glitters in it and as much as I want to gush about my love for this Polish, I can't even bring myself to get in a happy go lucky mood because of the Newtown Tragedy. Once again, I pray that God comforts the families of those who lost their innocent souls. Christmas is coming closer, and in the nail world, most people are starting to think of the perfect mani/nail art they'll have on their nails for that glorious day! Personally, I am not great at freehand nail art/design so I am always on the look out for "easy to achieve" nail art designs. I generally go for doticures, stamping or other form of easy nail arts. Another form of easy nail art I know is to use nail art strips or Nail Foils. Today, I shall be reviewing one of these by OMGNailStrips.Com. This is called The Christmas Tree Nail Foil on their website, and it's a Pretty White Christmas Tree on a red Base. And Here's how they were packaged. I got two Designs, but chose to review the more Season Appropriate one. 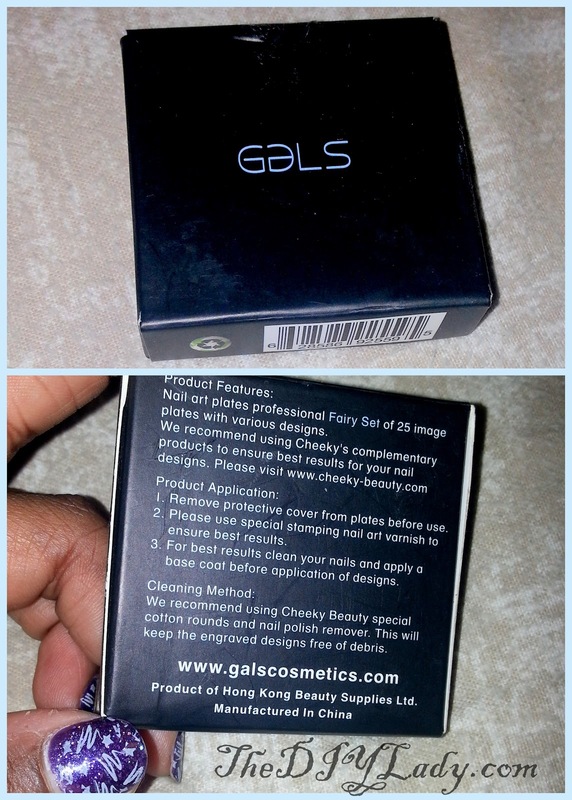 Behind Each Pack is an instruction on how to apply the foils to your nails. Since I have used nail foils before, I generally already knew how to apply these and didn't need their instructions. Lol.. I also found out that their instruction is kind of slightly misleading. NOTE: YOU DO NOT NEED TO CUT THESE as stated in #3. Once your nails are dry and clean (No hand creams, no base coat, just dry nails), Go ahead and apply the nail foil on your nails as shown below. Once you've placed the foil on your nail very well... Use a Nail File to file off the excess nail foil. Do this in a "Downward" filing manner so that you don't ruin the part covering your nail. I Love that these foils actually fit the curve of my nails perfectly. It's AMAZING that they do without needing to CUT them. There's a strip that's sure to fit each finger in the pack. Here's another picture for your viewing pleasure. How pretty are the trees?! Here are the rest of the strips I was left with after doing these four nails for my review. There's a lot more left to be used for a full mani if I choose to. (I Know 5 strips are missing, but that's because I used one as an experiment). I like these foils, and if you, like me, don't have much talent in the Nail Art Department, I'm sure you'll love these. These have a natural gloss to them, so you shouldn't need to add topcoat. The pictures you see above are WITH NO topcoat, but I did try to use topcoat. I found out that Seche Vite Top coat shrunk the nail foils and slightly lifted them up from the nail I applied Seche Vite to. Regular Topcoat (Color Club topcoat) worked fine with this. BUT, you really DO NOT need topcoat with these. No Glue, blow dryer, heat, or anything else is needed for application and once they're on your nails, they adhere pretty strongly. I tried to peel these off my nails after some minutes of application and can you believe they wouldn't even budge till I saturated my nail with polish remover?? THAT is a WIN in my Book!!! (Note: If you make mistake during application, you'll be able to remove and adjust them. But once you have used your fingers to press them on your nail and waited for more than 3 minutes, you might not be able to remove to adjust. THIS is a good thing, because that means the strips will last long on your nails. I will suggest these to my non-polish obsessed friends who want nail art but can't sit still to have it done. Application for these 4 nails took me about 15 minutes you guys. Including placement and filing the excess strips off!!! These Nail Foil Strips are lovely!! Anyhoo, that's it for now sugars. OMG Nail Strips has many more designs and you can check them out on their Website. Also Stay in touch with them on Facebook, Twitter, and Pinterest.